Any good and knowledgeable mechanic will tell you without hesitation that one of the most important tools you can have in your arsenal is a floor jack. Furthermore, any mechanic worth their salt will undoubtedly preach the message that a high quality jack is not only a wise investment but also a safety critical item. It goes without saying that any time you decide to lift 4000 pounds of steel into the air, you create a situation where gravity can become your worst enemy in the form of a falling car because as the saying goes, what goes up must come down. The value of a floor jack is that you control when your car goes up and when it comes down. Fortunately, there are quite a few great floor jack options out there that will assuredly keep you safe as you lift your car up into the air (provided you support the car with a good set of jack stands once it’s in the air). 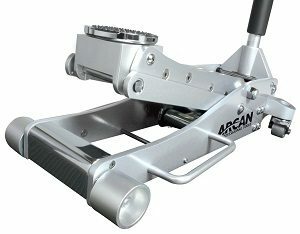 The Arcan ALJ3T 3 Ton Aluminum Floor Jack falls squarely into this category, and is admittedly one of our favorite jacks to date. The strength, durability, and overall polish of this jack simply made it too tempting not to review. When it comes to features, the Arcan ALJ3T is loaded. The jack is rated for 3 tons, which is adequate for most cars, trucks, and SUV’s. Despite the high capacity, the jack boasts a weight of only 56 pounds thanks to the ultra-light all aluminum body construction. When it comes to reducing the weight of the tool, Arcan has gone so far as to put lightening holes in the reinforced twist resistant lifting arm, which clearly demonstrates their level of dedication to the lightweight cause. Low height on the jack sits comfortable at 3.6″, which is low enough to slide under many sports cars and exotics. On the high end, the ALJ3T hits 19.4″, which should be tall enough to get cars with high ground clearance up in the air. This outstanding range of motion is accomplished via a dual piston pump, which not only allows for awesome height range but also allows the user to go from minimum to maximum height using minimal pumps of the handle…12 to be exact. Like most floor jacks, a rubber saddle sits atop the lifting arm to protect the underside of your vehicle. Similarly, the handle is padded to protect your hands, and can be disassembled into two pieces for easy storage. Jack movement relies on two front fixed casters and two rear bearing mounted swivel casters. A side mounted handle allows for easy fine tuning of your jack position before you start lifting, as well as allows for easy carrying. Another important feature to note is that this jack is equipped with overload and bypass valves which prevent you from inadvertently exceeding your jack’s capacity which ultimately serves to keep you safer. As with all Arcan products we have tried, build quality is second to none. The fit and finish on this jack is a work of art. Arcan skipped the flashy paint jobs in favor of the clear anodized raw aluminum look, which looks both sleek and modern industrial at the same time. The pictures may not do it justice, but it looks fantastic in person. Fit and alignment of all components is right on, and since the parts are clear anodized, there are no signs of overspray or chipping that you will typically see on cheap floor jacks. Based on their quality, Arcan jacks have made it into our top floor jack recommendations numerous times. This jack is absolutely no exception and in fact may be even better than the past Arcans that we’ve tried out when comparing build quality. We suspect that if you pick one up, you won’t have anything negative to say about it. When it comes to value, there are always many things to consider. First, you must consider quality. The ALJ3T is awesome from a build quality standpoint, no doubt. Second, you must consider features. Again, the ALJ3T is jam packed with features that ultimately serve to make your life in the garage that much easier. Lastly, one must consider price. The ALJ3T typically comes in somewhere in the mid-$200 range, which may sound expensive at first until you remember what you are getting for that price tag. As such, despite the higher than average price tag, we assert that this jack is still one of the best values on the market and we would most definitely recommend it to anybody looking for an awesome jack. “You get what you pay for” truly applies to this jack. While there are many places to buy Arcan jacks, Amazon.com ships for free which typically makes their shipped price better than almost anywhere else. As such, like with most of our jacks, we recommend you try there first as most online shops will charge an arm and a leg to ship something as heavy as a floor jack. Overall, we highly recommend this jack and are confident that you won’t be disappointed. If you’d like even more information, you can click here to see more pictures, read more reviews, and see prices!